Home › Drive Focused › Rally Your Support! A bill that would ban the use of cell phones while driving, but would allow the use of a hands-free device (Bluetooth earpiece), will again be making its way back through Minnesota Legislature in 2018. Despite widespread support from advocacy groups, law enforcement and others, the bill was unsuccessful in 2017. 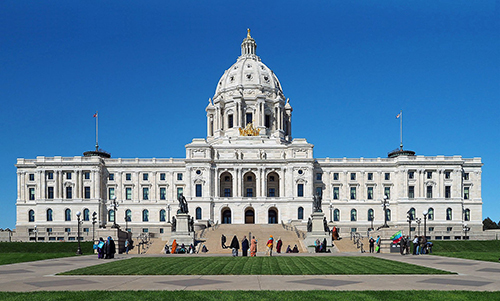 To help garner support for the bill, a Distracted Driving rally at the State Capitol has been set for Thursday, Feb. 22 at 10:00am – 11:30am at the Capitol Rotunda area. The rally is open to anyone. No sign up or registration is required. Just come out to the Capitol and show your support for this important legislation! Representatives from NorthstarMLS plan to be there in honor of longtime rules and regulations administrator, Hubert “Hugh” Skanes-Cady (Trimble). Talking on a hand-held cellphone while driving is currently banned in 15 states and the District of Columbia.